Raytheon Company has announced the company has built two small, Polar Scout satellites for the U.S. Department of Homeland Security (DHS) in partnership with Millennium Engineering and Integration. Photo of the company's SeeMe smallsat during the build process. These Polar Scout satellites have flexible radio frequency receivers to help search and rescue teams locate emergency beacons in remote areas, such as the Arctic. Raytheon assembled the small satellites at the company’s advanced missile production facility in Tucson, Arizona. The smallsats are part of a project led by the U.S. Air Force Operationally Responsive Space program to show how they can be built efficiently and cost effectively. Dr. Thomas Bussing, Raytheon Advanced Missile Systems VP, stated that with the company's automated production lines, Raytheon can produce highly reliable, small satellites quickly and affordably. 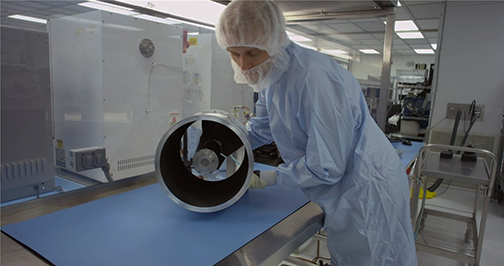 In addition to the firm's advanced manufacturing facilities flexibility, small satellites or satellite components designed by Raytheon or another company can be built.